Discuss the issue here and/or in the message thread attached to Ross’ blog post. And then take the straw poll. Previous PostLocally Grown’s new digital voicemail phone number and file upload storage areaNext PostWhat Builds Great Neighborhoods? I’m surprised how many people have answered “no.” While it’s a little unfortunate we have to write it into the constitution to make it happen, this is a modest increase for a very good cause. Our sales tax is really quite low right now; we have room to grow — why not put that money toward preserving our natural land? So you 18 “no” people, speak up! I’m not opposed to increasing the sales tax and dedicating it for this purpose. However, we should not have to amend the state constitution. Our lawmakers need to grow a spine, be brave, and legislate this. In theory, I agree. But, right now, today, this is the choice our representatives have given us. It doesn’t seem like we should sacrifice the benefits of this tax just for the sake of making a point about how our legislative process should work. Sean: Amending the constitution will also lock in future legislatures. There is no “sacrifice” if the amendment doesn’t pass; the legislature could pass legislation to increase the sales tax and to dedicate it to these causes. The legislature could do this, but they probably won’t. If they did, there’d be people unhappy about that, too (just look at some of those letters to the editor about David Bly). It will lock them in for twenty-five years, and this case, it’s probably a good thing. It won’t allow legislators to cut this particular spending to score political points. It is important to note that the League of Women Voters which does not generally support Constitutional Amendments IS supporting this one. The legislature has had many years to make a commitment to these issues and has not done so. There is little reason to think they will, of their own volition. The monies accrued, should the amendment pass, will still be under the control of the legislature to distribute, i.e. they will have to approve the distribution plan. A ‘danger’ is that the legislature will then divert money from other previously approved programs if they feel that there is a cap on dollars to be spent on protecting the legacy of the state. Sales tax is generally regressive, but MN does not tax two essentials, food and clothing; therefor this additional amount is not particularly damaging. Some ‘outdoors people’, hunters, etc, have complained about the addition of the arts into this amendment, others have deemed the passage essential to preserve our outdoor treasures; I find the Legacy dimension of this proposal to be integral to the character of the state. MN truly has something for everyone, and the diverse implications of Legacy in the amendment serves the quality of thoughtfulness of MNsotans , and the states attraction to diverse peoples, well. I am very surprised at the vote tally here; I had thought Northfielders were equally interested in their environment and their arts. I am very proud of my adopted state of MN, and will be prouder still, if this constitutional amendment passes. The proposed amendment pursues a worthy goal in a dangerously wrong way. I’ll vote NO. Spending decisons are a legislative matter, not a constitutional matter. Even spending on something like the court system, which is established via the constitution (unlike state parks or the state arts board), is a legislative decision. Leave the constitution alone. Here is a simple concept. Please ask your representative to sign it. 1. It’s $11 billion out of Minnesotan’s pockets. The almost half percent sales tax increase will generate $11 billion over 25 years, paid for by you, the taxpayer, and given into the hands of government. 2. It’s a Constitutional Amendment. If passed, the question on the ballot will be an amendment to the state Constitution, which will never go away. The Constitution is a document formed for the purposes of giving rights to the people and limiting the rights of government. A mandated tax increase and a mandated way to spend that money is an abuse of the state Constitution. 3. It mandates where $300 million each year will be spent. If passed, $300 million each year will be dedicated solely for the purposes of the arts and outdoors. Although these things are important, the role of the state legislature is to decide where taxpayer dollars are spent each 2-year budget cycle. We elect representatives to the legislature to prioritize spending. This amendment would allow $300 million of taxpayer money to bypass the legislative process and force them to spend it on the arts and outdoors, even if that year there were higher-priority needs for other things, like roads and education. 4. There’s no lack of current funds. Although few know it, millions of taxpayer dollars already go to fund environmental projects. The Department of Natural Resources has a 2-year budget of $1.5 billion. A portion of the state lottery proceeds goes to the Environmental and Natural Resources Trust Fund. The market value of this fund is currently at $415 million. Clearly, there is no lack of funding for environmental projects. 5. We can’t follow the money. If this tax increase passes, hundreds of non-profit organizations will lobby to get their hands on these government grants. As opposed to government departments, non-profits do not have to report where and how they spend their money. Once these non-profits receive government grants from the dedicated funding, taxpayers will never see where their money is spent. 6. It creates a scary precedent. This will be a precedent-setting amendment if it passes. Once our Constitution begins to dedicate money to specific spending projects, there will be no end in sight of coalitions and special interests enticed to seek constitutionally dedicated funding for their own pet projects. Just in September, Speaker Anderson-Kelliher (D-Minneapolis) mentioned she can now start planning a constitutionally dedicated gas tax. If this $11 billion ballot question passes, we can guarantee we’ll see many more and many higher tax increases on future ballots. 7. The first version of the bill was better. The tax increase on the ballot didn’t start out as a tax increase at all. Initially the idea was a bill to dedicate a portion of the existing sales tax to environmental conservation programs only. But that plan proved unpopular with liberal legislators who didn’t want to divert current sales tax revenue to rural environmental programs. So instead they are asking voters to increase the state’s sales tax by an additional almost half a percent and direct billions of those dollars to arts and cultural heritage. 8. Look who’s supporting this tax increase. Just looking at the 200+ groups supporting this tax increase shows that this is nothing more than a slush fund for special interest groups. Over half of the groups are arts and theater organizations. The only reason they are supporting this and are willing to give large donations to the vote yes campaign is because they know they will receive free taxpayer dollars if it passes. Don’t let them tell you this is for Minnesota’s outdoor heritage alone; billions of dollars will go to art and theater organizations. 9. The government is not a charity. We’re all supporters of the outdoors and we all love beautiful Minnesota. But that doesn’t mean the government should mandate a tax on Minnesotans so that non-profit organizations can get funding. Thousands of non-profits exist strictly off of charitable donations from people who support their causes. There’s no reason that these organizations should be any different. For infrastructure and environmental projects that benefit all of Minnesota, there’s plenty of money available through the DNR and the lottery. 10. We already pay enough taxes. Minnesota is home to one of the highest sales tax rates (6.5%) in the country, plus we have a high income tax rate too. If the ballot question passes, the sales tax will increase to 6.875%. Next add county and city sales taxes already implemented, and in Hennepin County alone, we’re looking at almost an 8% sales tax. In posting #1, Sean says, “Our sales tax is really quite low right now.” In posting #9, Peter quotes nosalestaxincrease.org as saying, “Minnesota is home to one of the highest sales tax rates (6.5%) in the country.” Can both be right? Minnesota has a 6.50% state sales tax. As of July 1, 2008, an additional 0.25% Transit Improvement tax was phased in across five counties in the Minneapolis-St. Paul metropolitan area for transit development. These counties include Hennepin, Ramsey, Anoka, Dakota, Washington. The Transit Improvement tax brings taxes in these counties to 6.75%. Saint Paul imposes an additional 0.5% tax, bringing the total to 7.25%. An additional 0.15% is imposed in Hennepin County to finance a new Minnesota Twins stadium, in addition to 0.5% imposed in Minneapolis, bringing the total rate in the city of Minneapolis to 7.4% and 6.9% in the rest of Hennepin County. Food (not including prepared food, some beverages such as soda pop, and other items such as candy) and clothing are exempt from the sales tax. Municipalities may be allowed by the state legislature to institute local option taxes. Rochester imposes a 0.5% for a total of 7.0 sales tax. Current local option taxes include a “lodging” tax in Duluth (3%), Minneapolis (3%), and Rochester (4%), as well as served “food and beverage” tax in Duluth (2.25%). An additional 1% sales tax is imposed in Duluth, bringing the total to 7.5%. Alcohol has a 9% sales tax statewide (6.5% sales tax, plus 2.5% gross receipts tax) not including any applicable local taxes. In addition to the local 1% sales tax added to Duluth sales, Duluth imposes an additional 2.25% tax on all food, beverage and alcohol sales at restaurants. Another good reason for including links to sources is that doing so is, in a sense, a search-engine “vote” for the site linked to. Roughly speaking, the way Google works is that when it’s crawling the Web and sees lots of links to some website, such as nosalestaxincrease.org, it figures that site must contain something people need or want to see, and consequently pushes it toward the top of the list when giving search results. California has an 7.25% statewide tax. Nevada has a 7.75% tax. Indiana and New Jersey have 7% taxes. Most states with taxes range from 4-6%, so while Minnesota is not among the the lowest, I’m still comfortable saying it’s too low right now (again, especially since most essentials are not taxed). With our without the increase, we’re certainly not the highest. The almost half percent sales tax increase will generate $11 billion over 25 years, paid for by you, the taxpayer, and given into the hands of government. This would be problematic if that were $11 billion going to waste, but it’s not. It’ll be spent right here, to benefit us all. It’s a Constitutional Amendment. If passed, the question on the ballot will be an amendment to the state Constitution, which will never go away. The Constitution is a document formed for the purposes of giving rights to the people and limiting the rights of government. A mandated tax increase and a mandated way to spend that money is an abuse of the state Constitution. I agree, but I think you need to be more pragmatic: this increase needs to happen. Because we as the people hold our legislators to unreasonable standards of low taxes, they will not (short of an extreme liberal, DFL majority) bring us this increase without the people demanding it. Yes, it’ll be in the constitution for the life of our state, but it will only be in power for 25 years. It creates a scary precedent. This will be a precedent-setting amendment if it passes. The precedent was already set by the transportation amendment. I too will be voting no on the ammendment. The consitution was not established as a funding source but rather to grant rights to the people. I am afraid that if we crack the door open with the outdoor / arts ammendment then others will be lining up for years to come. I can see an ammendment for education, sports facilitites, etc. I think we are best to leave this pandora’s box closed. The fact of the matter is, the legislature has neglected Minnesota’s outdoors for nearly 30 years. 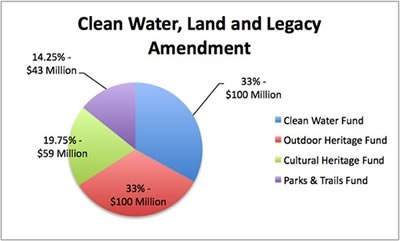 Each budget cycle, less and less money goes towards our lakes, rivers and streams. The problem with this is, while the funds have been depleted, the threats to our state’s natural resources are ever-increasing. We need a dedicated, sustained funding source that can only come from a constitutional amendment such as this. It is no one’s first choice to fund the outdoors and our cultural legacy this way, but based on the legislature’s failure to address serious problems, we must vote yes. When I was a kid, my family went camping often; usually in Minnesota. At the end of every camping trip, my parents would make me walk around our campsite and look for garbage to pick up – whether the mess was ours or not. “Always leave a place better than you found it” is a lesson that I have not forgotten. For me, that is really what this Amendment is about. I’ll be voting yes. Clean water is too important to ignore; future generations of Minnesotans are counting on us to do the right thing here. Let’s leave Minnesota better than we found it. For those of you who are fearful of using the constitution in the wrong manner…. I would generally DISapprove of amending a state constitution in this manner, however I believe in a certain degree of *direct democracy*. In MN there are not a lot of avenues for direct democracy as citizen initiative is not statutorily allowed. It is an accepted position that in states without initiative, a more fluid constitution must be allowed in order to allow for amendment at the will of the citizenry. Do you wish to be dictated to? Do you wish to have a voice in defining your government if your legislature is not being responsive? Witness our Federal Govt: You can destroy(maybe you would prefer seriously impact) the reputation of a nation in a very few years, 4-8; How long will it take to repair it? You can ruin a waterway in very few years of abuse: how long will it take to restore it? In the interest of having a fluid constitution, which responds to the will of the people of the state, therefor implementing a more direct democracy, I will be voting YES. Everyone has the right (a) to an environment that is not harmful to their health or well being; and (b) to have the environment protected, for the benefit of present and future generations, through reasonable legislative and other measures that (i) prevent pollu­tion and ecological degradation; (ii) promote conservation; and (iii) secure ecologi­cally sustainable development and use of natural resources while promoting justifi­able economic and social development. This guarantees the constitutional right, but leaves the specifics to the legislative process. Rob brings up a good point. For anyone who’d like to take a look at the constitution, you can find it here. This is not a new thing: there are all kinds of specific should-this-really-be-in-the-constitution kind of things. It will still have to be brought to the people. If it’s wasteful, then the people will probably reject it when the time comes. I would point out that land and water preservation benefits literally every person in the state of Minnesota — education and sports do not. I’m concerned that you guys are putting preservation of the integrity of a document ahead of preservation of the integrity of our state. That doesn’t seem reasonable. I don’t think anybody that votes no is against clean water or preservation. We do however now contemplate to give our government (Yup the very same that can’t balance it’s books right now without increasing taxes) a free slush fund that rises every year without any checks and balances. I also don’t agree with the notion that government should sponsor the arts. Who will decide what is art and what isn’t? Just like you Justin I do pick up other peoples garbage and until now I didn’t need any government to tell me this. Lots of good comments folks. My main frustration with this amendment is that it isn’t necessary—as long as legislators do their jobs. Our environmental work needs funding. I think all can agree on that. The unfortunate thing is that a very good funding mechanism was proposed in the legislature, but never enacted. That mechanism included a water access fee on all households and businesses, including farms. It seems to me this is a better way to raise funding for the environment and water clean-up plans. You essentially assess a ‘water clean-up’ fee at the front end and use it to clean our waters. I remain unclear about how the 19% funding for the arts came into the equation. The 19% was a concession to members of the legislature that would not support this bill without money for the “arts” I read an article not long ago that described the path that this took to get to the ballot. I will see if I can find it to link the article. I love to hunt and fish and enjoy the outdoor activities that Minnesota has to offer. With that said I am undecided on how I am going to vote on this amendment. The fact of the matter is the arts funding is what turns me off to this. To many times we have put “dedicated” funding in place for the outdoors and conservation only to have it siphoned off to the general fund and other causes. My gut says this will pass my head is just not sure if it is a good thing. Please vote NO for this amendment to the constitution. This is a poor way to fund the environment and the arts, and the compromise of adding arts just to get them to come along on the amendment shows that there is not enough legislative support for it. Ray has excellent points. VOTE NO on this amendment. Then tell your legislator to get to work to properly fund the arts and the environment–that is their job. Sen. Neuville followed this legislation from the beginning. Suffice it to say, politics make for strange bedfellows. Even if this were legislative, and not constitutional, it is still a pork barrel appropriation. Can anyone remember what happened to the $6 billion from the tobacco settlement? What bothers me about this amendment is the specific dollar amounts. While we now argue about fair priorities, in the future we may argue about how that is not enough money. Of course, sales tax is a percentage of good purchased… hmm. Maybe if we aren’t able to buy things, we’ll want to spend less on the environment. After all my thinking, I’ll vote yes. I ask, “Do I trust my legislator to do his job?” Past history tells me no. Is there another Teddy Roosevelt on the horizon to protect our resources? I’ll continue to research for reasons to vote no, unless I find a viable solution, I’ll vote yes to help ensure my son and his son or daughter is afforded the same experiences I enjoyed. Holly, you bring up an excellent point. Passing this amendment will be an excuse to NOT properly fund environmental and arts needs of the future–Tim Pawlenty style legislators will claim that they should not raise any more taxes since the people have already spoken. This amendment is a BAD compromise–it guarantees that legislators will no longer do their jobs, since funding is out of their hands. And if the economy goes bad (like it is) and people spend less money, there could be insufficient funds for needed projects. It is just bad fiscal policy to fund by constitutional amendment. Wow, the comments are right from the Taxpayers League the specialists in the “no” speech. They need a lesson in math, democracy, investment policies and at least a proposal to clean up our polluted waters. I am voting yes since the funds will be constitutionally dedicated to insure their expenditures, overseen by trained experts and the legislature, and truly protect the things we love about Minnesota. And for those willing to read our Constitution, you might want to visit the Taxation provision to see that this is not breaking any established policies, that is if you can’t remember the 2006 election when transportation funds were reallocated using the Constitution. This is the ultimate force of democracy, let the people decide to vote on it, be a part of the decision and reap the benefits of what we treasure in our State. I’m still struggling with this issue. Compelling points have been made here, pro and con. I am finding myself making an analogy to the savings strategy called “pay yourself first.” If you find, month after month, that there is no money left over to put into savings, it’s often advised that you pay yourself first, i.e., take your savings contribution off the top, before paying any other obligations and discretionary spending. Have your retirement contribution deducted from your paycheck; then you’ll start to not even miss it. If one believes that investment in our environmental and cultural heritage is vital now and that serious damage will result without such investment, and if the legislature consistently does not manage to allocate the funds to adequately make that investment, perhaps this is a prudent way to “pay ourselves first.” Given that people’s natural tendency is to put off paying to solve issues that aren’t dire right now (bridge maintenance, anyone? ), issues that can be put off will be put off. This proposed amendment is a way of making the point that it’s too important to keep putting off and we need to pay it first. Thoughts? If you make protection of the environment a constitutional right, as you suggested, Rob, I’m not sure how that step alone plays out as a practical matter to ensure adequate funding. It seems most of our guaranteed rights are not stated affirmatively, perhaps for this very reason, but negatively: “Congress shall make no law prohibiting…” The hunting/fishing amendment preserved the right of individuals to act in particular ways, subject to appropriate regulation for the common good, but it didn’t attempt to guarantee a general outcome. Well, now that I’m thinking out loud again, I worry about the farmers and food. If we put money in this it would be nice to look at how our lakes and streams get polluted, and use the money to offer incentives to farmers if they pollute. I’m not sure we’re asking for another “right”. How is the amendment worded? Does it say we have the right to a clean environment and give a certain percentage of pollution “not to be exceeded above…”? Or what? Of course, all of the amendments and the original articles of any constitution around here are vague and the courts are the ones to decide what it means… yes? I’m not against amending the Constitution again with a concern I consider a priority, and I think the sales tax will adjust with prices, and we can always demand more money be put into the environment. The legislators around here 4 miles north of Northfield (Mine are Garafalo, Pariseau, Kline, etc.) do what we ask them to do (provided a lot of us ask for the same thing). They seem to be doing their job, even if I didn’t vote for them. Nancy, in post 28 you infer that my NO response is from the Taxpayer’s League. Anyone who knows me knows that I am not right out of that radical, right-wing, (and I think, unAmerican) group funded by rich Republicans who are attempting to eliminate all of their taxes. I am a practical, liberal Democrat who sees a bad referendum that came out of a bad compromise that will NOT do what it is advertised–it will not clean up our waters or fund the arts to the extent required. It will put tax at the most regressive level-the sales tax–that unfairly taxes the poor. This funding for clean water and protecting the environment should be properly dealt with at the legislative level–not sent to a citizen referandum to get around a governor who can’t get anything done and is stopping the legislature from doing anything. If the legislators are not properly funding the states’ needs–education, the environment and the arts–vote them out and vote someone in who will support that platform. We should not fix the problem of a dysfunctional governor and dysfunctional legislature by amending the constitution–we should FIX the governor (impeach him) and fix the legislature by voting in legislators that support our needs. We should all be demanding the Minn Pollution Control Agency raise its standards–and start taking responsibility since we are getting away with dumping sewage into the Cannon River–what can we demand of our municipality? We seem just fine with our pollution but want to pass a constitutional amendment to go after everybody else? Everyone is for having a clean environment, but actually doing the work to get there is tougher–this amendment will not make it better or easier–it will, however, guarantee that funding will fluctuate with the economy (based on retail sales) and guarantee legislators will fight to deny any other funding–no matter how badly needed. Please VOTE NO and, make sure your legislator knows you support properly funding the environment and the arts. That means you must vote for the one you want, and contact them about your views–a bit more work than going out and casting an easy vote that will not ease the environmental burden. Yes, Jane is certainly NOT a right-winger. Ha ha! I laugh. Are you sure Nancy was thinking of you? It made me go look at the taxpayers league website just to see.